Kelly Sundberg’s essay, “It Will Look Like a Sunset,” originally appeared on Guernica. About domestic abuse, this candid essay went viral, leading her eventually to a book deal: Goodbye, Sweet Girl, to be released June 5th from Harper Collins. Seems an opportune time to revisit the original essay, so very potent. And also, this essay about her essay, by Melanie Bishop, originally published on Essay Daily. I postponed reading this essay for a few days, even though it had come highly recommended by a friend. A quick glance told me it was about domestic violence, and something made me click on to another essay. Probably the same something that made me postpone seeing Twelve Years a Slave: an aversion to cruelty. Sometimes I let myself be in denial that brutality is as pervasive as it is. But the title of the essay (pretty), combined with what I’d gleaned the topic to be (not pretty), made me go back looking for it and I’ve now read it half a dozen times. Sundberg succeeds in doing what the best memoirists do–takes disturbing incidents from her life, grapples with them, assigns to them a language and a style, a poetry, thereby elevating the disturbing incidents to the level of art, of beauty. In the process, the difficulty being examined and probed and articulated, goes through a transformation. In preparing the material for a reader, in transforming it to art, Sundberg, I imagine, finds herself having landed on a different shore of her own experience. There’s a view there she’s maybe not seen before, and the air is more fit for breathing. “It Will Look Like a Sunset” is a feat, a gift, a warning, an exorcism, and a cheer. Line by line, it’s an essay that warrants study. Each character is introduced with one specific detail, and then bam, surprise pregnancy. Marriage. We’ve slid into the world of this essay with so little fanfare. Another writer might spend pages developing the romance, building the relationship, pondering the pregnancy issue. But Sundberg gets right to the crux matter: two people, a child, a lot of unknowns. A crap shoot. We feel already a foreboding, from only two sentences. The fourth paragraph leaps ahead in time by eight years–Sundberg has skillfully given us the briefest necessary history before dropping readers into the night in question, the night the rest of the essay pivots around. There’s been a bowl dropped on a foot, the resulting break and the bruise and the urgent care doc suggesting the essay’s title. Small paragraphs, separated by space breaks, jumping back and forth in time, replicate a vulnerability and a sense of a disjointed present. “It happened so slowly, then so fast.” A hummingbird in the house foreshadows entrapment, smallness, panic. A scar is described as a star; a bruise as a sunset. Take the ugly and make it pretty. Given all this essay accomplishes, what I most admire, finally, is Sundberg’s ability to persuade. We come out of her essay believing that a partner can be both loving and dangerous. Warm and monstrous. A good father and a frightening husband. I admire the care she takes to present a fair and three-dimensional portrait of her abuser. She tells us he was more often kind than unkind. She says, simply, “We respected each other.” Even on the worst nights, when she seeks refuge at a local Travelodge, she returns home before morning, “…climbing into bed and wrapping my arms around Caleb’s back.” She admits, “I still loved him. I told myself he would get better.” Heartbreaking. Complicated. True. I have not stopped thinking about this essay, and plan to read—next time without delay—anything Kelly Sundberg writes. Bravo. 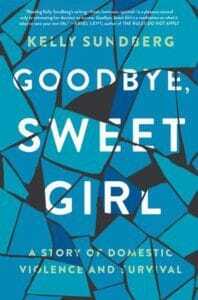 Look for Bishop’s review of Goodbye, Sweet Girl in early June.